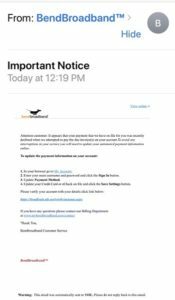 BendBroadband has become aware of a possible e-mail scam. Customers are receiving an email with a subject line: ‘Payment Declined’ and it states it’s from ‘TDS Billing.’ If you hover over ‘TDS Billing’, it actually shows an address of dobnflorence@wildblue.net. Within the email it states the customer’s recent payment has been declined and to avoid any interruptions in service, they will need to click on some links to update their payment information.